Poor Ned. All his wives die. Do you have a source for this? Wikipedia says she's still alive... nothing on CNN, either. 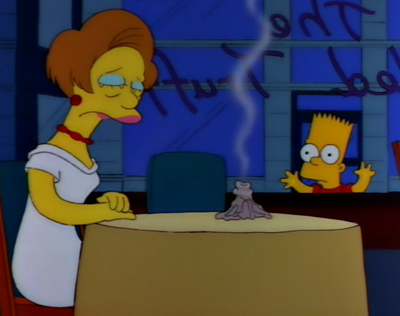 I love the episode Bart The Lover which featured Edna. Edna was my favorite non-Simpson female on the show. The cougar teacher was just hilarious character and her interaction with awkward Skinner was great. Her interaction with Bart also had some funny but some very sweet moments as well.